← let’s start with this. I have been wanting to share this salmon dish with you for ages, but it’s never felt like the right time. Partly this is because, as you’ll see below, I have found the challenge of getting a decent photograph of the finished dish to be somewhat insurmountable. It’s also partly because I have been a little sheepish about its list (if you can call it that) of ingredients. There was a time when I am not even sure I would have called this a recipe. I used to feel that no dinner worth its proverbial salt could be had without hours of lovingly coaxing into being in the kitchen, accompanied by large glasses of wine and several friends. That in fact dinner was not worth having without several large glasses of wine (and a few friends). That there was nothing in life worth standing in line for; that any activity that required me to wear practical shoes was not something I wanted to be a part of; and that cheap shoes were never worth it. There was a time when I would have insisted that three ingredients, including the salmon, does not a recipe make. Certainly, a meal that could be made, from start to finish, in roughly half an hour, would not have met with much approval, nor would it find its place into the quasi-public domain that is this blog. But as I said, I am not as immoderate (or should that read intolerant?) as I used to be, and there is absolutely nothing extraneous that can be added to improve this ultra-simple dish. If your night-waking this week is induced by visions of a complicated Thanksgiving feast, this might be the perfect antidote. I actually baked it in the same hot oven, at the same time, as a pan of this cauliflower (I tossed some curry powder in with it and omitted the capers and sundried tomatoes), and it worked out perfectly. In a small bowl, whisk together sugar and mustard until sugar is dissolved and mixture is smooth. 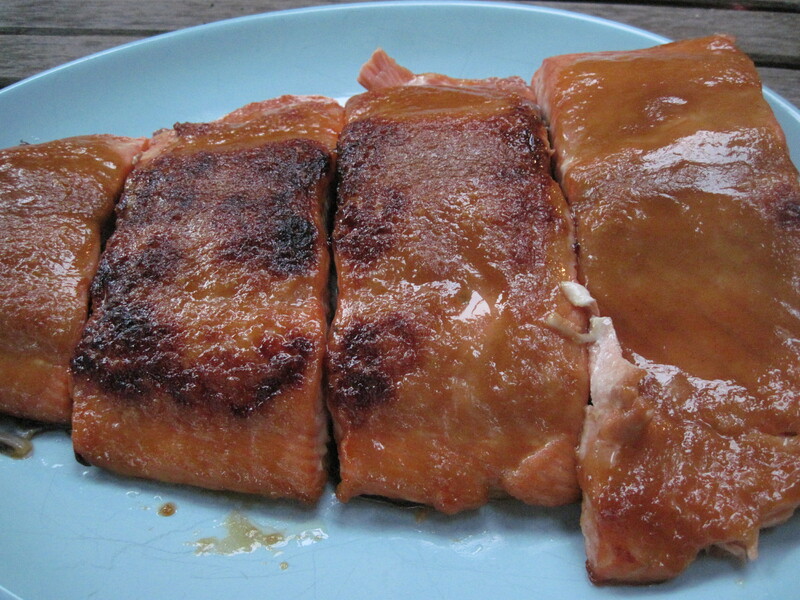 Place salmon filets in a lightly oiled glass or ceramic baking dish just large enough to hold them. Spoon mustard mixture over salmon filets and cook in the middle of the hot oven 15 minutes, or until salmon is bronzed on top and still bright pink in the center.